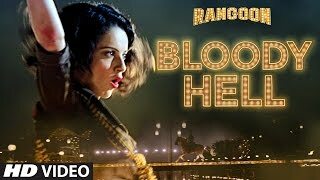 watch the Video Song " Ek Dooni Do" from the Bollywood upcoming movie "Rangoon" starring Kangana Ranaut, Saif Ali Khan & Shahid Kapoor in lead roles and movie directed by Vishal Bhardwaj and produced by Sajid Nadiadwala and Viacom 18 Motion Pictures. Watch brand new Hindi song "Yeh Ishq Hai" from Bollywood upcoming movie "Rangoon" starring Kangana Ranaut, Saif Ali Khan & Shahid Kapoor in lead role. The movie is directed by Vishal Bhardwaj and produced by Sajid Nadiadwala and Viacom 18 Motion Pictures.